Lots of Giveaways This Christmas. This One is from Ogbuta Super Glue. 100,000 naira just for you this Christmas! 3. Tag Ogbuta_NG and use the #ChristmaswithOgbuta. 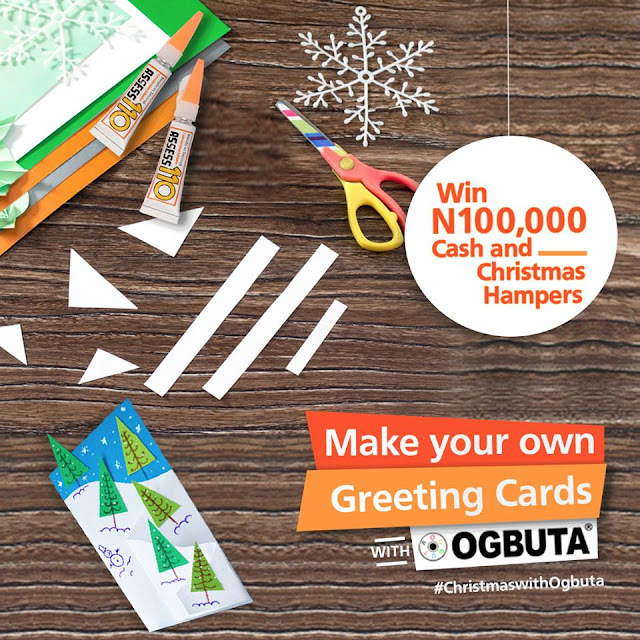 2 winners will be selected weekly and the best greeting card will win N100,000! The Contest runs From 16th November, 2017 and ends on 22nd December, 2017. These general conditions apply to participation in the Christmas with Ogbuta activity. By participating in this activity, the participant agrees to the following terms and conditions. 1. The activity is administered through the Facebook platform but it is in no way endorsed or sponsored by Facebook. 2. The activity is open to everyone resident in Nigeria irrespective of race or tribe. 3. It is recommended that anyone under the age of 18 years be fully assisted by his/her guardian, who approves of and consents to participation in the activity and the participant’s receipt/possession of the card. 4. The Promoter reserves the sole right to disqualify any entries that contain profanity, sexual content, abusive language or any other offensive content. 5. Participants are only allowed to make one entry. Multiple entries will be considered invalid during the shortlisting process. 6. Participation in this offer is deemed as acceptance of these Terms and Conditions. By entering this Promotion each participant agrees to release, discharge and hold harmless Ogbuta, its legal representatives, affiliates, subsidiaries, agencies and their respective officers, directors, employees and agents from any damages whatsoever suffered or sustained in connection with this activity. 7. The activity runs from 16th November, 2017 and ends on 22nd December, 2017. 8. By participating in this activity, we reserve the rights to use your images for communication purposes during this period. 9. The Promoter reserves the right to verify the validity of entries, at any time during or after the activity, and reserves the right to disqualify any participant for tampering with the process. 10. The Promoter reserves right to store the details of participants for promotional purposes.